Pioneers in the industry, we offer trioday, tenvir em tablet, tenvir l tablets, lamivir s 40, lopimune tablet and zidovudine tablets from India. We are the Leading suppliers of Trioday. We also do Drop Shipping of Trioday. 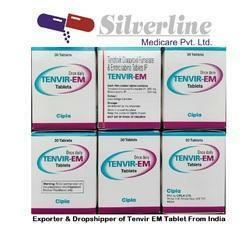 We are the Leading suppliers of TENVIR L Tablets. 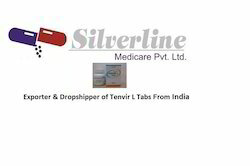 We also do Drop Shipping of Tenvir L Tabs. We are the Leading suppliers of Lamivir S 40. 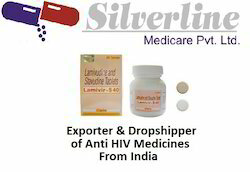 We also do Drop Shipping of Lamivir S 40. We are the Leading suppliers of Lopimune. 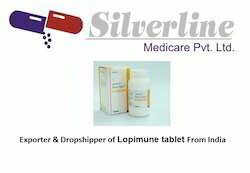 We also do Drop Shipping of Lopimune. We are the Leading suppliers of Zidovudine Tabs. 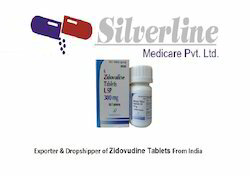 We also do Drop Shipping of Zidovudine Tabs..
We are the Leading suppliers of Viraday Tablets. 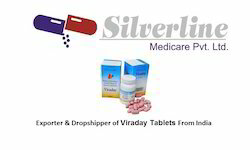 We also do Drop Shipping of Viraday Tablets. Tenofovir is used in combination with other antiviral drugs in the treatment of human immunodeficiency virus (HIV) infections. It may also be used in very limited cases of long-term infections of liver caused by hepatitis B virus Tenofovir is an antiviral drug belonging to class nucleoside reverse transcriptase inhibitors (NRTIs). Its structure closely resembles the natural structure of viral DNA, that helps it to incorporateitself into the viral DNA. By doing so, it blocks the activity of an important viral enzyme reverse transcriptase which is involved in the replication of viral DNA, a process essential for survival of the virus.Myopathy ; kidney problems., Low potassium levels, Lactic acidosis ; liver problems, Increased liver enzymes, Pancreatitis ; muscle weakness; increased creatinine levels, Urge to vomit, Angioedema ; bone pain and fractures, Low blood phosphate level, Dizziness; loose motions, Vomiting; skin rashes, WeaknessLamivudine indicated as part of antiretroviral combination therapy for the treatment of Human Immunodeficiency Virus (HIV) infected adults and children and also used in the treatment of Hepatitis B virus infection. We are the Leading suppliers of Viraday. We also do Drop Shipping of Viraday. Looking for Hiv Care Products ?